Larry Brown is the fifth-winningest coach in National Basketball Association (NBA) history and universally acclaimed as one of the greatest teachers the sport has ever known. He was elected to the Naismith Basketball Hall of Fame in 2002. Student Brown, a University of North Carolina basketball star from 1961 to 1963, won an Olympic gold medal at the 1964 Tokyo Games as a member of the champion United States basketball team. He was a member of the 1961 United States gold medal Maccabiah Games basketball team. The 5’9” guard was named to the 1963 All-Atlantic Coast Conference team and drafted in the 7th round by NBA’s Baltimore Bullets. But Brown opted to play for Goodyear's (Akron, Ohio) Amateur Athletic Union team, winning the Most Valuable Player Award in the 1964 AAU Tournament. Brooklyn-born Brown played five seasons in the American Basketball Association (ABA)—three times an All-Star guard—with New Orleans, Oakland (1969 ABA champions), Washington, Virginia and Denver, averaging 11.3 points per game. The point guard led the ABA in assists and was the All Star Game’s MVP in 1972. His ABA stats: 4,229 points, 2,509 assists, 1,005 rebounds. 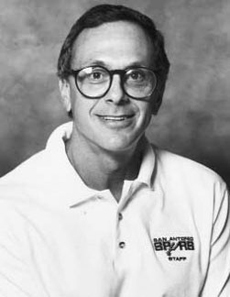 As a player and coach Larry Brown was part of the ABA for all nine seasons of the League’s existence. Brown, turned to coaching in 1972. After a “cup of coffee” stop at Davidson College, he signed with the ABA’s Carolina Cougars, and was named ‘Coach of the Year his first of two seasons at the helm. The 1974-75 season found Brown leading the Denver Nuggets, where he earned Coach of the Year honors in 1974-75 and 1975-76. The Brown-led Nuggets won their division titles both seasons, but 1975-76 marked the final season for the ABA. Nonetheless, he continued to coach the Denver franchise when it joined the NBA for the 1976-77 season, winning two division titles in three seasons. In early February of the 1978-79 season, Brown resigned as Nuggets coach. Less than two months later, he accepted the head coaching position at the University of California at Los Angeles (UCLA). In his first season, Brown led the Bruins to the National Collegiate Athletic Association's (NCAA) Final Four, losing to Louisville in the 1980 championship game. The following year, his third-ranked UCLA team again qualified for the NCAA Tournament, but enjoyed less success, prompting him to resign. Later that year, Brown was back coaching in the NBA, taking over the head coaching job of the New Jersey Nets. The Nets were the Eastern Division’s last-place team before Brown took the reins, but he led them to the playoffs in his first full season, as well as the following year. Under Brown, the Nets were 91-69 from 1981 to 1983. But, the following season, he accepted the top coaching job at the University of Kansas. Between 1984 and 1988, the Brown-led Kansas Jayhawks enjoyed a 129-44 record and captured the 1988 NCAA Tournament Championship, American college basketball's top prize. But, Brown decided to return to the NBA, and from 1988 to 1992, he coached the San Antonio Spurs to the playoffs the latter two of three full seasons. Nonetheless, holding a 21-17 win-loss record, he left the Spurs 38 games into the 1991-92 schedule (his fourth) and took over the top coaching spot with Los Angeles Clippers, with 35 games remaining in the same season. The Brown-directed Clippers finished the NBA season with 23 wins and 12 losses, and did something the franchise hadn’t done for years––they made the playoffs. The following season, the L.A. team made the playoffs again, this time with a 41-41 won-loss record. However, at season's end, with two years left on his contract, Brown resigned as Clippers coach. In 1993, he took over as head coach of the NBA's Indiana Pacers, enjoying three consecutive winning seasons, taking them to the playoffs three times and Eastern Conference finals twice. After the Pacers finished a subpar 39-43 in 1996-97, Brown left Indiana and emerged in Philadelphia as the NBA 76ers' head coach and vice- president of basketball operations. Brown led the 76ers for six seasons, coaching them to the NBA playoffs five consecutive years (1997–2002). Philadelphia reached the NBA finals in 2001, and Brown was named NBA Coach of the Year. The following season, his last in Philadelphia, Brown was elected to the Basketball Hall of Fame. When the NBA’s 2003-04 season launched, Larry Brown was now at the helm of the Central Division’s Detroit Pistons, the same NBA franchise coached by brother Herb Brown from 1975 to 1978. Big brother Larry promptly accomplished the improbable––he led his underdog Pistons to the NBA championship over the highly favored Los Angeles Lakers. By getting the Pistons to the playoffs, Brown became the first coach in NBA history to guide seven franchises into the annual post-season competition. During his Pistons period, Brown accepted the position of head coach of the 2004 USA Men’s Olympic basketball squad. At the Athens Games, however, his “dream team” managed only a disappointing bronze medal. He had also been an assistant coach for the 1980 and 2000 USA Olympic teams. No one else has been both a player and head coach of the U.S. Olympic basketball team. Following a second season with the Pistons (2004-05), Detroit management let him out of his multi-year contract, whereupon the NBA’s New York Knicks made him the highest-paid coach in League history. The romance with New York endured only a single season, but Brown nonetheless recorded his 1,000th NBA game victory. Following a one year sabbatical, Brown took over the head coaching position with the Charlotte Bobcats for 2008-09 season. It marks his 9th NBA coaching job. At the start of the 2008-09 season, Brown’s NBA teams had won 1008 games, losing 798. He has led his teams to 17 playoff appearances, eight 50-win seasons, seven division titles, three conference championships, and the aforementioned 2003-04 season NBA championship. He is the only coach to win both NBA and NCAA championships. Inasmuch as he is still an active coach, Larry Brown's coaching record is incomplete.